An IT degree with the credentials you need. 2018 EC-Council Academic Partner of the Year. 2016 CODiE award winner from the Software & Information Industry Association for Best Learning Relationship Management Solution. Named a Best Value School by University Research & Review four years running. Recognized nationally for quality, affordability, and innovation. Solving problems and designing solutions is your calling. To advance your career, employers expect you to prove your skills and show what you've got. That's the same way you earn a degree at WGU. And by including certification prep and exams into your coursework (covered by your tuition), our programs offer a smarter bundle, tailored to today's IT industry’s requirements. WGU has been named a "Best Value School" by University Research & Review. Problem solvers and math lovers needed! Your task: Lay the groundwork for the computing breakthroughs that will enable tomorrow's technologies. Time: 74% of IT bachelor's grads finish in 6–36 mos. Tuition and fees: $3,520 per 6-month term. Transfer: Your previous college coursework and existing certifications may waive course requirements, helping you finish even faster. Professionals who need the skills a computer science degree provides include computer systems analysts, computer programmers, artificial intelligence specialists, software engineers, machine learning engineers, and more. Time: 83% of graduates finish in 9–18 months. Certifications: CIW, Oracle, and CompTIA certs, all included. Unique to WGU's program is the incorporation of a Udacity Nanodegree—a highly recognized credential designed to prepare you for a career in data science. Additional certifications included are CompTIA A+ (Parts 1 and 2), CompTIA Network+, and CompTIA Project+. Time: 73% of graduates finish in 7–37 months. Certifications: Includes CIW, ITIL, LPI and CompTIA. Also, the LPI Linux Essentials and ITIL® Foundation Certification are central to this program. Included CompTIA certifications are A+, Network+, Security+, Project+, and Cloud Essentials. A program designed to arm you with the certifications and credentials you need for a career like systems administrator, computer systems analyst, cloud support specialist, AWS support administrator, and more. Time: 74% of graduates who earn an IT bachelor's degree from WGU finish in less than three years. Earning certs on the path to your degree gives you credentials that will boost your résumé right away, even before you complete your online degree program. Time: 73% of graduates finish in 6–18 months. Time: 81% of graduates finish in 12–48 months. Certifications: several CIW and CompTIA included in this program. CompTIA certifications included are A+, Network+, Security+, and Project+. This program will help you develop strong skills in network design, network operations, and security management. You're a creative and tech genius who wants the bigger opportunities. Time: 73% of graduates finish in 9–33 months. CompTIA A+ and Project+ are included in the program coursework. Software development is the second-highest rated specialty within IT. Secure your future with a degree and additional certifications. Time: 72% of grads earned this degree in 18–48 months. Tuition and fees: $3,545 per 6-month term, plus one-time Health Professions Student Fee of $350. This CAHIIM-accredited program makes you eligible for the RHIA exam. Time: 71% of grads finish in 17–41 months. Tuition and fees: $3,370 per 6-month term. Key competencies of these online courses align with industry needs: management and leadership, networks and security, and information systems management. Become the authority on keeping infrastructures and information safe. Time: 72% of graduates finish in 6–20 months. Tuition and fees: $3,835 per 6-month term. Certifications: two EC-Council certs, included. This program was designed in collaboration with national intelligence organizations and IT industry leaders, ensuring you'll learn emerging technologies and best practices in security governance. Time: 87% of graduates finish in 6–18 months. Master data mining, visualization, and SQL—and lead analytics at the business of your choice. Time: 82% of graduates finish in 6–24 months. Included in your program—at no extra cost—is the valuable PMI Certified Associate in Project Management (CAPM) certification. Maximize the opportunities that your IT career path has afforded you—earn your master's and keep moving up. Time: 98% of grads finish in 6–18 months. Tuition and fees: $3,945 per 6-month term. Learn to navigate emergencies, execute strategies, and optimize systems with the competencies within this specialty MBA. The opportunities in the IT field are limitless—and your experience can take you a long way. But a surefire way to protect your career is by tackling a degree. Unlike certs, a degree never fades, becomes outdated, or ceases to be recognized. Program options in IT are robust. These are our newest or most popular degrees—maybe one fits your interests. Women in Leadership Scholarship. Apply by June 30. 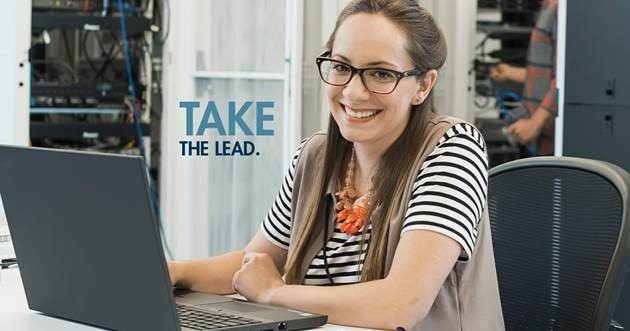 For a limited time, the $2,000 Women in Leadership Scholarship can help you achieve the flexible, affordable, respected bachelor’s or master’s degree that will get you closer to your place at the top. Western Governors University is accredited by the Northwest Commission on Colleges and Universities (NWCCU), which provides accreditation to many other institutions, such as the University of Washington, University of Oregon, University of Utah, University of Idaho, and Brigham Young University. As a program member of both the Microsoft® IT Academy and the National Cyberwatch Center, WGU is able to offer students world-class technology curriculum and courseware that will help develop the skills and knowledge that gains you respect in your industry. The Software & Information Industry Association (SIIA) recognized WGU’s Business of IT – Project Management course, called uCertify LEARN, as the Best Learning Relationship Management Solution. This course is found in many of our IT programs and includes the CompTIA Project+ certification. The IT industry is hands-down the most exciting territory to explore. Variability of backgrounds, paths to success, lifestyles and geographic hot spots—the picture that emerges is fascinating. Are you curious what's driving the demand for cyber professionals? Are you looking for a fail-safe career path that's still cutting-edge and tech-driven? 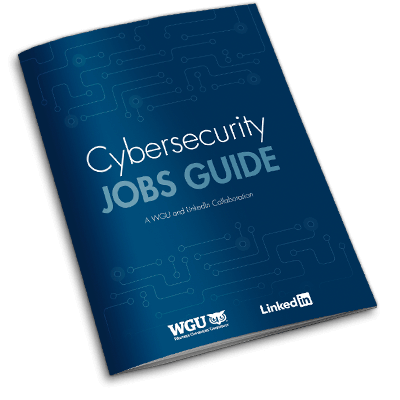 Our new jobs guide covers it all, and LinkedIn data plus several industry professionals validate the trends that WGU is seeing. See what opportunities this robust industry may have for you! Rashaan's WGU degrees changed his life. 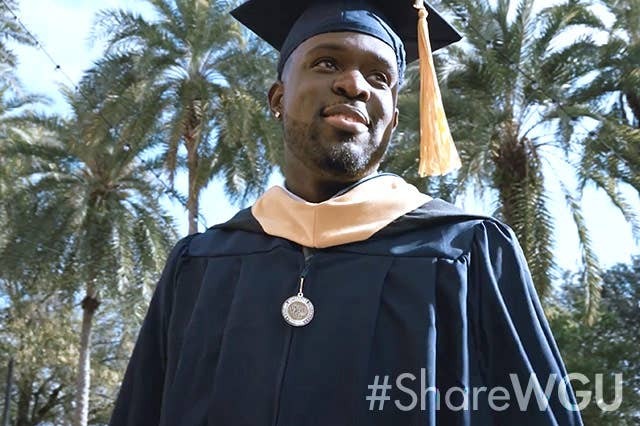 Before earning his first WGU degree, Rashaan was unemployed four times. He was evicted from his home. Since earning his bachelor's degree—and then a master's—at WGU, he has built a thriving career in cybersecurity. He even turned down two job offers because his employer offered to double his salary if he'd stay! Program councils—teams of industry and academic experts—drive the ongoing development of our IT degree programs and curriculum, providing input on the competencies a successful graduate needs to have mastered. It’s one way WGU ensures your degree delivers relevancy and value. Discover which WGU program is the path to your unique career goals. ¹ 2018 Harris Poll survey of 300 employers of WGU grads.